Tavurvur is an active stratovolcano located on the southern edge of the Gazelle Peninsula in East New Britain Province in Papua New Guinea (PNG). Borders Matupi Harbor and Matupi Island to the west, Lakunai Airfield to the northwest and further beyond is Rabaul. To the south is Blanche Bay. Also known as Tavurvur volcano, Mount Tavurvur, Mt. Tavurvur or Matupi Volcano. Today located in East New Britain Province in Papua New Guinea (PNG). 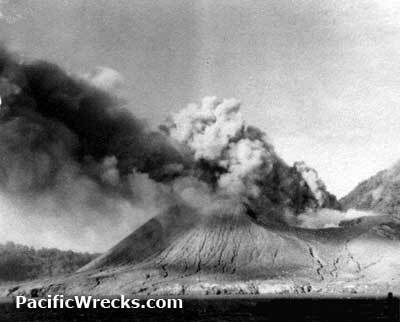 During 1937, Tavurvur had a major eruption that destroyed Rabaul. In 1941, another large eruption happened causing a large ash plume. Prewar, Dr. Fisher was the volcanologist based at the Observatory Ridge (Volcano Observatory). During the night of January 22-23, 1942 the Japanese landing at Rabaul, an eruption illuminated the night sky, helping to guide the Japanese landing force ashore. During the Japanese occupation of Rabaul 1942-1945, minor eruptions from Tavurvur sometimes interfered with flight operations at Lakunai Airfield and Rabaul or coated aircraft with ash. During the war, Dr. Fisher was consulted by the Royal Australian Air Force (RAAF) about the possibility of triggering an eruption by dropping aerial bombs into the volcano. In the middle of March 1943, the U. S. Army Air Force (USAAF), 43rd Bombardment Group (43rd BG) headquarters conceived an idea to bomb the crater of Tavurvur in hopes of triggering an eruption that would impact the Japanese. On March 23, 1943 between midnight and one o'clcok, during a night bombing mission, B-17E "Monkey Bizz-Ness" 41-2417 dropped two 2,000 pound bombs into the crater of Tavurvur, but failed to cause any eruption. This was a special mission conceived by 43rd Bombardment Group headquarters to bomb the crater of Tavurvur (Matupi Volcano) in hopes of triggering an explosion that would impact the Japanese. Although both bombs landed inside the crater it failed to trigger anything. During 1994, Tavurvur had another major eruption that covered Rabaul and the entire area in ash. Today, Tavurvur is quite without eruptions. Adventurous people can trek to the summit to look into the crater. Seismic and volcano monitoring equipment is situated in the vicinity to monitor volcanic activity at the Volcano Observatory and worldwide.